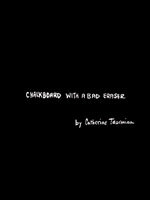 CHALKBOARD WITH A BAD ERASER is a collection of poems from and of my late adolescence. Written in a style I call "warped confessionalism", I "pour out" skewed truths. It is best that people over 15 only read my book. This is not a children's book. The book has a 1995 copyright and was published in 1996. Some of my poems are cited in the Dr. Sharon Klayman Farber book "When The Body Is The Target: Pain, Self Harm and Traumatic Attachments". According to the Barnes & Noble Astor Place staff, I had the largest non-celebrity turn-out when I read from my book. If you are interested in purchasing a copy of my book, I would be very grateful if you did! Email me at catherinetaormina@rcn.com for info. It makes a great gift for a "warped" friend! The book is $10 plus shipping. I accept money orders or cashier's checks. It is truly a unique experience! Truly a coffee table book! Read in 1/2 an hour!